Still you are paying your DHBVN electricity bill in offline? Dakshin Haryana Bijli Vitran Nigam Ltd is providing the Online DHBVN Electricity Bill Payment option for South Haryana power consumers. Stop to go for offline electricity bill payment & Start to use online mode of payment. Many online users may not know to make a payment from online. Here, Ebillpayment will help you. From this post you can learn a full information about how to pay DHBVN Bill Payment in Online and check DHBVN Bill Status through DHBVN official payment portals. You can also view billing history of your dhbvn electricity account. If you need a dhbvn duplicate bill for your future purpose, you can download a duplicate bill copy. Not only for electricity payment , Ebillpayment is also providing a complete guidance to make the Mobile & Broadband bill payment, credit card bill payment, Insurance premium payment and other utilities through online. DHBVN is providing the power distribution in South Haryana including the districts of Bhiwani, Faridabad, Fatehabad, Gurgaon, Hisar, Mewat, Narnaul, Rewari, Sirsa, Jind. UHBVN distributes the power supply in the Northern region of Haryana including Ambala, Yamuna Nagar, Kurukshetra, Karnal, Kaithal in Panchkula Zone and Panipat, Sonipat, Jind, Rohtak and Jhajjar in Rohtak Zone. If you need to make a UHBVN electricity bill payment online Click here to learn more. Consumers should follow the below simple steps to make a DHBVN online bill payment in Haryana electricity official payment portals easily in 2 to 3 minutes. 1. Click here to reach the official page for DHBVN bill payment. 2. Enter your customer account number and click the ‘submit’ button. 3. At the next page you have to furnish your mobile number and email address. 5. Choose the payment mode and fill up all the required details to complete the transaction. 6. 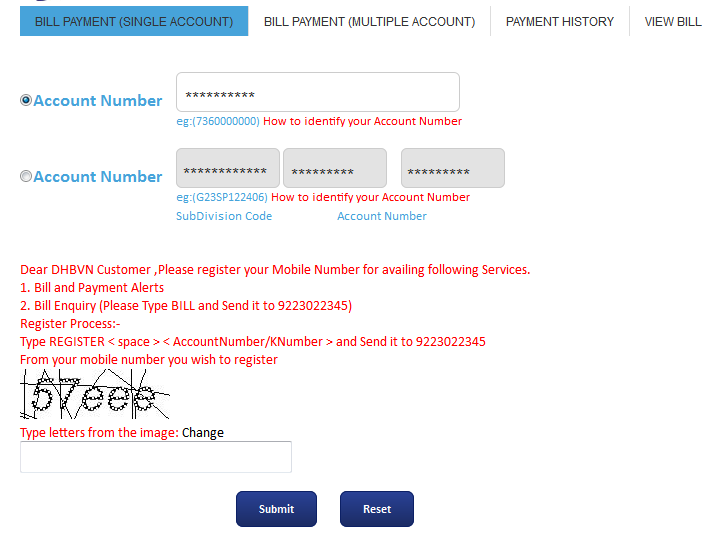 You will get a confirmation of the successful bill payment on your mobile or email. Consumers can also make multiple DHBVN bill payments at a time. At the top of the page, you will find an option for multiple bill payments. The facility allows you to enter more than one account no. and pay them online. Now you can check and view your DHBVN billl payment history by filling the account Number or Bill Desk ID and click submit button. If you have any queries regarding DHBVN bill payment through online, you can feel free to share with us through comment section. We will clear your queries as much as possible. You can also share you suggestion to us and our visitors. If you like this post, you may share this post on social media.